LUFKIN – The Lufkin/Angelina County Chamber of Commerce is now accepting nominations for the 2012 Spirit of Angelina Award presented by Perry-Ellis Kia. The Spirit of Angelina Award recognizes volunteers of Angelina County that are the backbone for many events, organizations, and the community. Because of them, many events and organizations exist and are successful. Volunteers donate their time, energy, and efforts to ensure events and organizations run smoothly. For all these reasons and numerous others, volunteers deserve the community’s appreciation and gratitude. The Spirit of Angelina Award is a way to honor volunteers from various organizations across the county. The Lufkin/Angelina County Spirit of Angelina Award is selected annually from among written nominations. Five (5) nominees are selected to be recipients of the award each year. Nominations are solicited from all nonprofit organizations in Angelina County. Nominations may be submitted by any interested party; however, self-nominations will not be accepted. Finalists and five recipients are selected by an anonymous committee of the Lufkin/Angelina County Chamber of Commerce with consultation from the Chamber Board of Directors and members as the committee deems appropriate and/or necessary. Nominee must be available to attend the Spirit of Angelina Award breakfast on Wednesday, August 22, 2012 8:20am at Crown Colony Country Club; must be a resident of Angelina County; must use unpaid time to perform the activities for which he or she is being nominated; may be reimbursed for any expense associated with the volunteer activities. These are guidelines that give the selection committee the most complete information possible upon which to base a decision. Answer only those questions that apply to the nominee. Unanswered questions will not have a negative effect on the nomination. Submitted nominations are encouraged to have attached letters and other reference material in support of the nominee. Nominations are due Monday, July 9, 2012 by 5pm to the Lufkin/Angelina County Chamber of Commerce. No late applications will be accepted. Visit www.LufkinTexas.org for the nomination form. 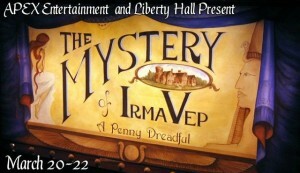 TYLER- Liberty Hall is proud to once again partner with APEX Entertainment to present “The Mystery of Irma Vep” March 20-22, at 7:30 p.m.